Source: Chemical Geology 476:481-492. | January 5th, 2018 | Craig L, Thomas JM, Lutz A, .Decker DL. Groundwater is the primary source of water in the Upper East Region of Ghana, and is generally considered a safe source of drinking water; but there are pockets where the groundwater contains high concentrations of fluoride due to the dissolution of minerals in the local granite. The goal of this study is to evaluate the hydrogeology and hydrogeochemistry of an area where dental fluorosis endemic, in order to identify the optimum locations to pump and distribute low-fluoride groundwater. As expected, the data indicate that the higher elevation recharge areas with outcrops of Bongo granite have elevated concentrations of fluoride in the groundwater (up to 4.6 mg L? 1), posing the highest risk of fluorosis in the nearby communities. The lower elevation areas, which are the farthest from the Bongo granitic, have the lowest groundwater fluoride (< 0.5 mg L? 1) and the lowest risk of fluorosis. Groundwater flow models suggest that the steady decrease in fluoride is driven by dispersion, with the fluoride concentrations dropping to the World Health Organization’s recommended drinking water limit of 1.5 mg L? 1 at about 400–500 m from the source. The optimum locations to install boreholes (or use existing boreholes) for piping low fluoride groundwater to the higher fluoride areas, would be at or beyond this distance. Although the initial costs of developing such a water system would be substantial, this is a potentially viable option for providing low fluoride water to communities suffering from fluorosis. The Upper East Region of Ghana is semi-arid, economically poor, and primarily rural with most residents working as subsistence farmers. The majority of households rely on groundwater collected from drilled boreholes with hand-pumps or hand-dug open wells for their domestic water. 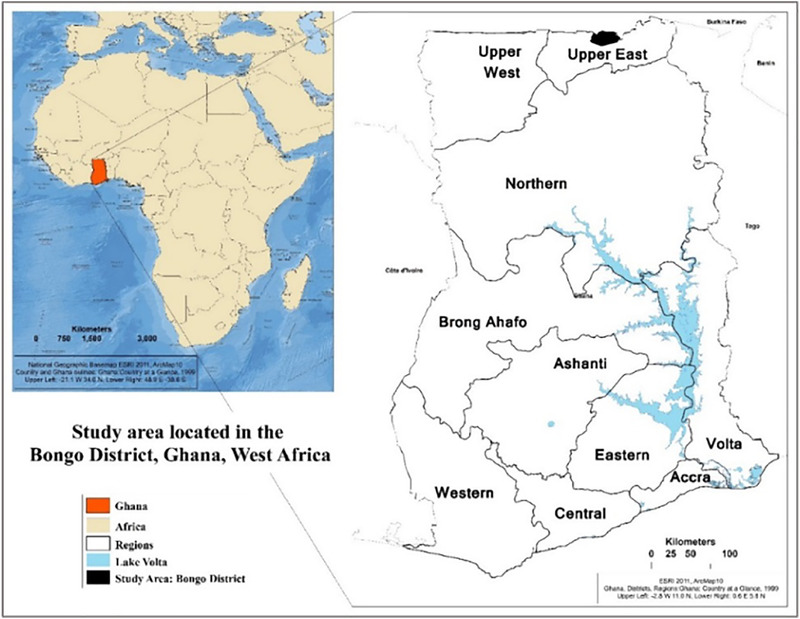 Groundwater is generally considered a safe and economical source of drinking water, but there are pockets in the Upper East Region where the groundwater contains concentrations of naturally occurring fluoride well above the World Health Organization (WHO) recommended limit of 1.5 mg L? 1 (WHO, 2011). The source of groundwater fluoride is Bongo granite (Apambire, 1996, Apambire et al., 1997, Apambire, 2000); and the result of consuming high fluoride groundwater is an increase in cases of dental fluorosis (Apambire, 1996, Apambire et al., 1997, Apambire, 2000), as well as an increased risk of skeletal fluorosis. Due to the health risks of drinking high fluoride water, many drilled boreholes in the region remain closed because the fluoride in these wells exceeds 1.5 mg L? 1. Drilling boreholes and then leaving them closed is not just wasteful economically, but it exacerbates the ongoing problem of limited access to safe drinking water in a water stressed region. The study area of Namoo in northern Ghana has pockets of high fluoride groundwater and correlated cases of dental fluorosis (Craig et al., 2015). The objective of this work is to characterize the hydrogeology, geochemistry, and groundwater chemistry of Namoo to better understand the distribution of groundwater fluoride, and to identify conditions that may influence its concentration. The results are intended to identify areas with low fluoride groundwater, in order to utilize existing boreholes or drill new ones to be tapped as safe drinking water sources. The water from these boreholes could then be distributed to nearby communities that lack a safe drinking water source. This approach would save money on drilling costs and provide more options for sources of low fluoride drinking water in an economically poor, water stressed region. The study area of Namoo is located in the Bongo District, Upper East Region, Ghana (Fig. 1). To map the location and elevation of wells in Namoo, hand-dug open wells (open wells) and drilled borehole hand-pump wells (boreholes) were identified and marked with a Garmin eTrex Vista global positioning system (GPS). Obtaining accurate elevation measurements from hand-held GPS devices is difficult, so to minimize the relative error, all of the elevation readings were recorded in a single day with a clear sky and maximum satellite strength, with all elevations presented as meters above sea level. Water level in the open wells was measured once manually during each the late wet (September 2012) and dry (April 2013) season with a Solinst water level meter. Depth to the bottom of open wells was determined by lowering a weighted rope to the bottom of each well. Manual measurements were also taken from the closed boreholes (not in use = no hand-pumps). To continuously monitor changes in groundwater levels, Schlumberger Diver water level-loggers were installed in two closed boreholes with a barometric pressure logger also located in the study area. 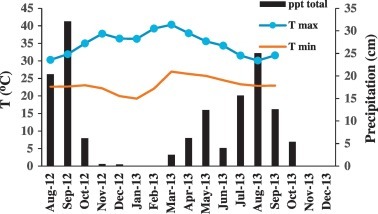 Each Schlumberger Diver recorded pressure every 30 min: one from April–October and the other from April–December 2013. Beginning in late July 2012, seasonal variation in air temperature and precipitation was monitored by installing a Decagon weather station to record air temperature and precipitation every 30 min. Pumping rates were also collected for 13 boreholes in the Bongo District. Fig. 1. The location of the Bongo District in the Upper East Region of Ghana. The community of Namoo is an electoral area within the Bongo District. Water samples were collected from 40 open wells and 17 boreholes during the late wet (September), late dry (April), and shoulder (October–November) seasons and analyzed for fluoride concentrations. Boreholes with hand-pumps were pumped for several minutes before collecting samples and were also usually in use by community members which further purges the well. As a result, the samples collected from these boreholes provide a consistently accurate representation of the groundwater chemistry. Most open wells were used regularly with those samples also providing an accurate representation of the chemistry of the water being consumed. However the few infrequently used open well samples may provide less accurate representations of the local groundwater, because flushing the wide diameter wells before sample collection was not possible. Samples collected from closed boreholes are also less reliable because they were not well flushed before collecting a sample. The water samples were collected in Nalgene polypropylene copolymer centrifuge tubes. They were analyzed the same day for fluoride using an Orion 4-star meter and fluoride ion selective electrode, with TISAB III added to the sample just before analysis (APHA, 1998). The fluoride ion selective electrode was calibrated by creating calibration curves using 1 and 10 mg F? L? 1 standards or 0.1 and 1 mg F? L? 1 standards, depending upon the concentration of the sample, with the electrode calibrated every eight to ten samples to maintain an accuracy within 5%. The accuracy of the calibration curve was also checked with 5 mg F? L? 1 standard for the higher range calibration curve, and 0.5 mg F? L? 1 for the lower range calibration curve. The majority of samples, including those from all boreholes and open wells with fluoride concentrations above 2.5 mg L? 1, were analyzed again at the Desert Research Institute in Reno, Nevada using a new fluoride ion selective electrode. The repeat analysis was done to confirm accuracy within 5%. The pH was measured immediately upon collection using a gel-filled Ag/AgCl pH electrode attached to an Orion 4-star meter. The conductivity and temperature were also measured immediately upon collection using an Oakton conductivity meter, as was dissolved oxygen using a YSI 55 dissolved oxygen meter. Alkalinity was measured the day of collection using a Hach field alkalinity kit. Seventeen borehole and 34 open well samples collected during the late wet and dry seasons were also analyzed for major ions. These samples were filtered in the field with a 0.45 ?m filter and collected in two 30 mL Nalgene bottles. One bottle was for major anion analysis and the other for major cation analysis. The anion samples were kept frozen, or refrigerated, and were analyzed within 28 days of collection. The cation samples were acidified to pH < 2 with concentrated HNO3 after filtration. All major ion analyses were conducted in a USEPA Certified laboratory. Analysis of chloride (Cl? ), nitrate (NO3? ), and sulfate (SO42 ?) were conducted using a Dionex Model ICS 2000 ion chromatograph, and analysis of sodium (Na+), calcium (Ca2 +), potassium (K+), and magnesium (Mg2 +) were conducted using a Thermo Scientific Elemental SOLAAR M5 atomic adsorption spectrometer. Samples of Bongo granite were collected at the ground surface from three locations in the study area with high fluoride groundwater. These samples were analyzed using X-ray diffraction (XRD). Each bulk sample was prepared by hand grinding an oven dried fraction (< 2 mm) to a grain size under 500 ?m and then grinding to a powder in a McCrone mill for 8 min in 10 mL of methanol. The samples were then air dried overnight, gently re-crushed in a pestle and mortar and side-loaded into a sample holder. The resulting XRD scans were viewed and interpreted using Bruker XRD data evaluation software called EVA, with background corrections performed before interpretation. Minerals were identified by matching reference mineral patterns stored in the International Centre for Diffraction Data (ICDD) database to the observed peaks. The same samples were also analyzed using X-ray fluorescence (XRF), which were conducted with a Rigaku Primus II wavelength dispersive spectrometer (WDXRF) that is capable of detecting elements from atomic number (Z) 4 (beryllium) through atomic number 92 (uranium) at concentrations from the low parts per million (ppm) range up to 100% by weight. Quantification was performed using the Fundamental Parameters (FP) standard-less quantification software associated with the system. The relative accuracy usually ranges from better than 5% up to ~ 20% for major elements. (5) Eq. (5) is independent of time and species, and is a function of the transverse dispersivity (aT) and the spatial coordinates, with ? equal to one along the central line and zero as y and z approach infinity. The three-dimensional distribution of groundwater fluoride was also modeled using PHAST (Parkhurst et al., 2010). The parameters used here were nearly identical to those used in the semi-analytical model described in the previous section. A detailed description of solute transport modeling using PHAST can be found in Parkhurst et al. (2010). The average maximum and minimum air temperatures for the study area were recorded from August 2012 to September 2013, and the total monthly precipitation from August 2012 through December 2013 (Fig. 2). The total precipitation for 2013 was about 84 cm, from early March through October, while August 2012 through July 2013 had 100 cm of precipitation. The highest monthly rainfall occurred in September 2012 (32 cm) and August 2013 (25 cm). March usually had the highest air temperatures. The lowest air temperatures were December–January. This period is the Harmattan season, which is characterized by low-humidity and northeasterly trade winds. Fig. 2. The average monthly maximum and minimum air temperatures and total monthly precipitation in Namoo from mid-2012 to late 2013. Total precipitation for 2013 was about 84 cm. The elevation contours, location of granitic areas, and location of high, moderate, and low fluoride wells are presented in Fig. 3. The wet and dry season water level contours are presented in Fig. 1S using water levels measured from the same wells during each season. The groundwater flow lines mirror elevation for the most part, which is consistent with Martin (2006) interpretations, and the groundwater flow direction is nearly identical in dry and wet seasons. Groundwater flow is radially away from the highest elevation recharge area in the northwest part of the study area. Most of the groundwater flows toward an ephemeral stream surrounding Namoo to the north and east. The study area contains eight communities: Done, Abungo, Tendongo, Nayire, Akaamo, Abasikoma, Koom, and Awale (Fig. 3). Done in the northwest part of the study is the highest elevation community and is the location of most of the Bongo granite outcrops. This area is also where elevated groundwater fluoride is most concentrated, with groundwater fluoride concentrations decreasing in the direction of groundwater flow and with distance from the granitic outcrops. The seasonal changes in groundwater levels and depth to the bottom of 25 open wells are presented in Fig. 4. The late dry season measurements were taken in April of 2013 and the late wet season measurements were taken in September 2012. During this study, the water level in the open wells never dropped below the well depth. The seasonal fluctuations in water levels measured from open wells ranged from zero to seven meters (Fig. 4). Table 1S presents the average, maximum, minimum, and median water levels and well depth for most of the open wells in the eight communities. Measuring groundwater levels of the boreholes in use was not possible. However, Table 1 presents manual measurements taken from closed boreholes. The closed boreholes with water level measurements closest to the surface are in lower Done (elevations 249 and 253 m), with the lowest water level relative to the surface in Nayire (elevation 250 m). Water level measurements recorded every 2 h in 2013 for two of the closed boreholes in Done are presented in Fig. 2S. The closed borehole at elevation 249 m (lower Done) with a water level close to the land surface responds more quickly to precipitation than upper Done (261 m). The seasonal fluctuation in groundwater of 3.2 m measured from the upper Done closed well is also greater than the seasonal fluctuation of 2.7 m at 249 m elevation measured in lower Done. Fig. 4. Bar graphs of the depth to groundwater and well depth from ground surface in the late wet (September 2012) and dry (April 2013) seasons in 25 open wells, separated by community. The numbers above each set of bars is the seasonal variation of water levels (WL) in meters for the corresponding open well. The horizontal line at six meters depth indicates that the bulk of open wells are six or more meters below the land surface. Table 1. The manually measured depth to groundwater for six closed boreholes and approximate elevation. The water level measurements were taken before the hand-pumps were installed in each borehole, after which point no more measurements were taken (NM = no measurement). a The highest measured water level for 2013, presented in Fig. 2S, with the peak one month apart for two Done boreholes, showing the approximate day in parentheses. Groundwater samples were collected and analyzed for 17 boreholes and 40 open wells. Samples were collected in the late shoulder (October–November 2011), wet (September 2012), and dry (April 2013) seasons, with additional samples collected from 11 boreholes in early 2016. The results of fluoride (F?) concentrations in boreholes (including closed boreholes) are presented in Table 2, and open wells in Table 3, with the installation year and community in the second to right and far right columns respectively. All wells are listed chronologically by the year installed. The fluoride concentrations measured in the closed boreholes are less reliable because the water was not well flushed; therefore, those concentrations are not included in determining average F? concentrations. The highest groundwater fluoride concentrations are usually in the boreholes. Three of the four boreholes with fluoride above 3.0 mg L? 1 had hand-pumps installed by the community in 2012 and 2013, and were subsequently open for public use. Boreholes with the highest fluoride concentrations are within or close to the Bongo granite outcrops (Fig. 3). The only borehole that showed much seasonal change in fluoride, ranging from 3.7–4.6 mg L? 1, is number 9 in Table 2 which is at the edge of lower Done. Of the 17 boreholes, only three have average fluoride concentrations at or below the WHO recommended limit of 1.5 mg L? 1 (WHO, 2011). Table 2. The fluoride (F?) concentrations of boreholes in the Namoo study area, including the approximate year the borehole (and hand-pump) was installed. The first boreholes were installed in the 1970s but the year is not certain. Samples were collected for wet, dry, and shoulder seasons. Fluoride concentrations from boreholes identified as “closed” were excluded from average values. Highlighted values have average fluoride concentrations above the WHO (2011) recommended limit of 1.5 mg L? 1. NS = no sample; U. = upper Done; L. = lower Done. a Samples collected in late shoulder-early dry season = January 2016. All others were collected between 2011 and 2013. Table 3. The fluoride (F?) concentrations of open wells installed in the study area, the year installed if known. Samples were collected for the wet, dry, and shoulder seasons. Highlighted values have average fluoride concentrations above the WHO (2011) recommended limit of 1.5 mg L? 1. NS = no sample; L. Done = lower Done. Table 3 presents the seasonal fluoride concentrations for 40 open wells in Namoo. The shallow open wells generally have lower fluoride concentrations and more seasonal fluctuation than the boreholes. Just one open well has an average value above 3.0 mg L? 1, although most of the year it is 2.7 mg L? 1, and 9 of the 40 open wells have fluoride concentrations above the WHO (2011) recommended limit. 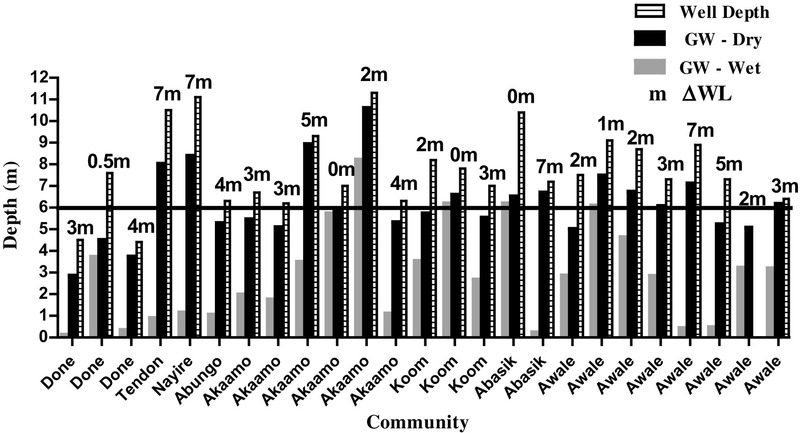 Most of the highest fluoride open wells are in Done and Koom, with a few moderately high fluoride wells in Akaamo (Fig. 3). The average, median, minimum, maximum values for pH, alkalinity as bicarbonate (HCO3? ), and conductivity are presented in Table 4 for all wells using wet and dry season data only (see Tables 2S and 3S for water chemistry data sets). The groundwater temperature for all wells averaged 30.1 °C (std dvn = 0.9), and the dissolved oxygen averaged 4.3 mg L? 1 (std dvn = 0.9). Silica concentrations collected in 2010 from 10 boreholes in the Bongo district (including Namoo) ranged from 60 to 86 mg L? 1 with an average of 76 mg L? 1. Table 4. Wet and dry season water chemistry data for boreholes (BH) and open wells (OW). The values for all OWs and BHs are presented in supplementary data Tables 2S and 3S respectively. Major anions and cations were analyzed for groundwater samples collected in the late wet (September) and dry (April) seasons for boreholes and open wells. The average, minimum, maximum, and median values are listed in the Table 4, determined from values presented in 2S and 3S. The fluoride concentrations presented in Tables 4, 2S, and 3S2 include wet and dry season data only. The correlation between the concentration of various water chemistry parameters and fluoride concentrations presented in Table 5 were calculated in GraphPad Prism using the Spearman correlation coefficient (r) and the corresponding p value at a 95% confidence interval. The results presented in Table 5 show a statistically significant inverse correlation between sodium and fluoride for the borehole samples, and direct correlation between magnesium and fluoride for the open well samples. There are also statistically significant direct correlations between nitrate and chloride for the boreholes, and between bicarbonate and calcium, and bicarbonate and magnesium for all wells. In addition, the correlation between dissolved fluoride and the minerals fluorite (CaF2(s)), calcite (CaCO3(s)), and dolomite (CaMg(CO3)2(s)) was determined. There is a strong direct correlation between fluorite and fluoride, and no correlation with the other minerals listed above (Table 5). Table 5. Spearman correlation coefficients (r) and p values to determine statistical strength of the correlation (95%) between the concentrations of two ions, and fluoride vs. the minerals calcite (CaCO3(s)), dolomite (CaMg(CO3)2(s)), fluorite (CaF2(s)) in groundwater. Negative r values indicate an inverse correlation and positive r values a direct correlation. A p value > 0.05 indicates no correlation. The XRD results are presented in Table 6 and XRF results are presented in Table 4S. The XRD results show that all samples are mostly quartz and feldspar: plagioclase (albite) and alkali (microcline), with minor amphibole and calcite. Sample 3 also has minor biotite. They are mostly alumino-silicate by weight, followed by potassium (in microcline and mica) and sodium (in albite), and all contain a small amount of fluorine (Table 4S). Granite sample 1 has 800 mg kg? 1 fluorine and the other two granite samples have 1400 mg kg? 1 fluorine. 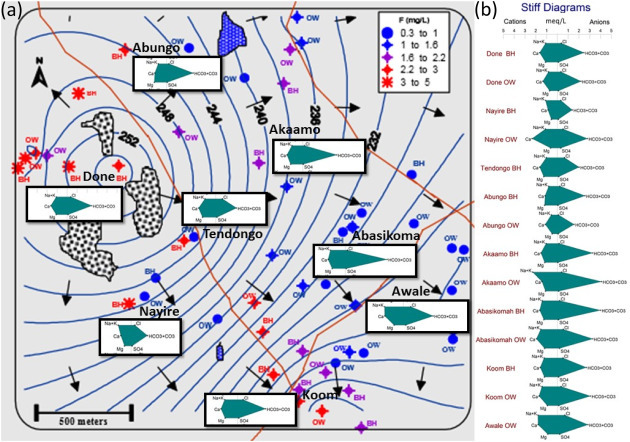 The fluorine levels in the three granite samples collected in this study are consistent with the fluorine in Bongo granite presented in Apambire et al. (1997), which averaged 792 mg kg? 1 fluorine and ranged from 200 to 2000 mg kg? 1 (n = 12). Table 6. XRD analyses of Bongo granite collected in three locations in the study area, where groundwater fluoride concentrations are high. b Example of an amphibole, which can also contain Ca, K, Na. c Minerals that may contain fluorine. (6) where, L is the distance traveled in the x-direction. Eqs. (2), (3), (4) presented in Section 2.4 used the dispersion coefficient (DL), defined as the dispersivity (?L) multiplied by the linear velocity (vx). The transverse dispersivity was set at 0.2 m because this value resulted in a modeled distribution of groundwater fluoride comparable with measured values presented in Fig. 3. The time was set to 15,000 days (~ 41 years) to simulate steady state conditions. The z-location was set at 0.1 m from the origin, and the y and x distances were varied to create the fluoride distribution shown in Fig. 5a. The results presented in Fig. 5a indicate that fluoride concentrations decrease steadily due to longitudinal and transverse dispersion. Fig. 5. (a) Results of a semi-analytical three-dimensional solute transport model (Domenico, 1987), from an areal fluoride source (410 m by 15 m Y and Z respectively, and X = 0.1 m). The contour lines represent the fluoride concentrations (mg L? 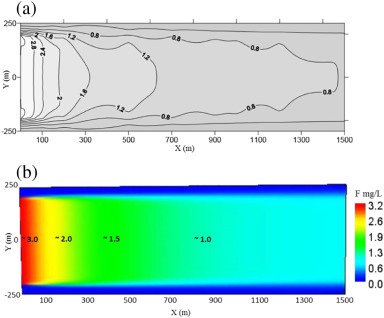 1) with the results presented using Surfer; (b) results of a three-dimensional contaminant transport model using PHAST (Parkhurst et al., 2010) from an areal fluoride source (410 m by 10 m Y and Z directions respectively, and X = 0.1 m). The results are presented using Model Viewer (Hsieh and Winston, 2002). For both models the initial fluoride (F?) concentration of 3.2 mg L? 1 is fixed, no chemical reactions are occurring, the longitudinal dispersivity is 9.13 m, and the transverse dispersivity is 0.2 m. The vertical dispersivity is 0.2 for the PHAST model only, with no vertical dispersivity used in the semi-analytical mode. 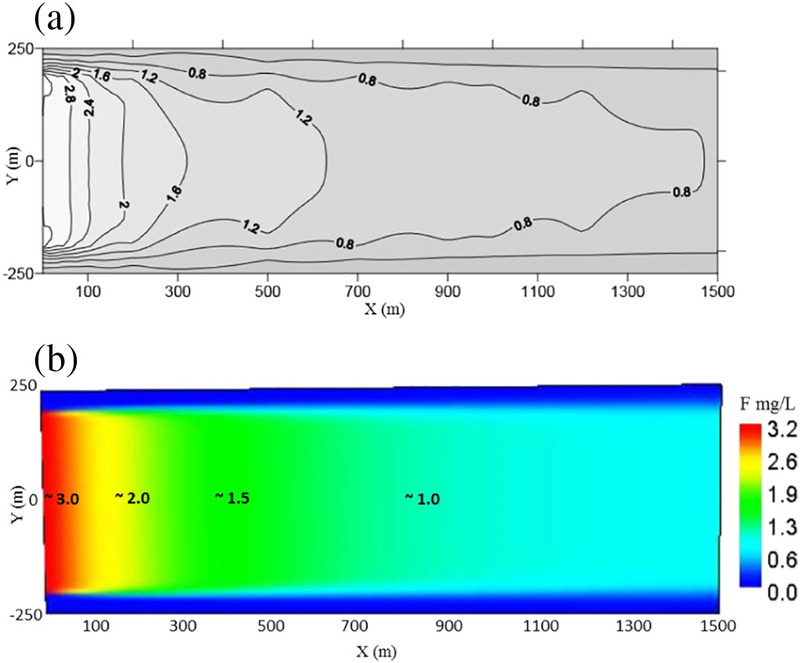 A groundwater flow model was also developed using PHAST (Parkhurst et al., 2010) to simulate the distribution of groundwater fluoride in a three-dimensional homogeneous aquifer, using the same input parameters as those used for the semi-analytical model described in the previous section, with two exceptions. The PHAST model included a vertical dispersivity value of 0.2 m, and the area of the fluoride source was 410 m by 10 m for the Y and Z directions respectively. These input parameters were used to create a modeled distribution of groundwater fluoride comparable with the measured distribution presented in Fig. 3. The results are presented in Fig. 5b, and are similar to those presented in Fig. 5a, indicating a steady decrease in groundwater fluoride concentrations with distance traveled due to dispersion, including vertical dispersion. The geology of Namoo has two main types of underlying rock (Fig. 6, study area inside red box). One is a K-feldspar-rich granitoid, which is mainly Bongo granite and monzonite (2097 ± 2 Ma). 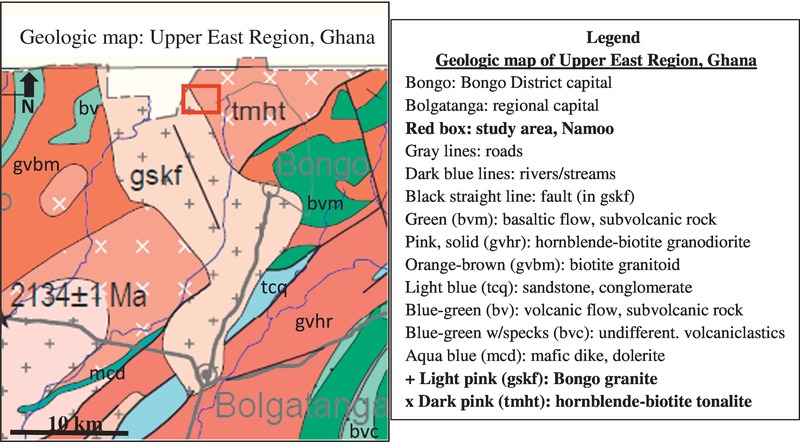 The Bongo granite is represented by the light pink portion on the left side of the red box in Fig. 6, and is part of the Eburnean Plutonic suite (Geological Map of Ghana (2009), from Murray (1960), Geological Survey Department of Ghana). In Fig. 3 it is the area comprising Done, Tendongo, and Nayire with outcrops of Bongo granite shown in Fig. 3 on the left. The other underlying rock type, which is represented by the dark pink on the right side of the red box in Fig. 6, is hornblende-biotite tonalite, minor granodiorite, minor quartz, and minor diorite (2134 ± 1 Ma). 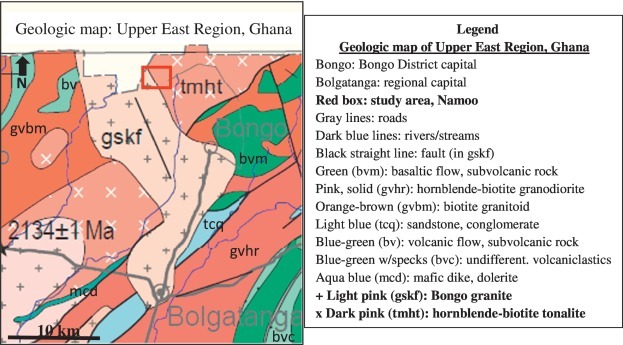 It is part of the Tamnean Plutonic suite (Geological Map of Ghana (2009), from Murray (1960), Geological Survey Department of Ghana). In Fig. 3 this area comprises Akaamo, Abasikoma, and Awale. The communities of Koom and Abungo, and even parts of Akaamo, likely start at the edge of the transition from Eburnean Plutonic suite (Bongo granite area) into The Tamnean Plutonic suite (Fig. 3, Fig. 6). From Geological Map of Ghana (2009), modified from Murray (1960), Geological Survey Department of Ghana. The portion of the study area underlain by and containing outcrops of Bongo granite is also, as expected, the region with the highest fluoride groundwater (Fig. 3). The Bongo granite contains biotite (sample 3 only) and amphibole (see Table 6), both of which can contain fluorine (Boyle, 1976). The most important minerals generally affecting aqueous fluoride concentrations are fluorite (CaF2(s)), apatite (Ca10(PO4)6 (F, OH, Cl)2(s)), micas (e.g. biotite), amphiboles, and villiaumite (NaF(s)) – but especially fluorite due to its higher solubility than the other minerals (Apambire, 1996, Apambire et al., 1997). Bongo granite analyzed by Murray (1960) contained the same minerals as the samples presented in Table 6, except calcite, and also included trace accessory fluorine (as in Table 4S). In addition, 25 thin sections of Bongo granite collected by Apambire (2000) summarized the mineralogy as follows: quartz 4–30%, microcline 22–75%, plagioclase 3–40%, with more variable biotite and hornblende. Low concentrations of fluorite at 0.1–0.2% and apatite at 0.1–1% were also identified in the thin sections. The fluorite and apatite concentrations were likely too low to be identified in the XRD analyses of Bongo granite presented in this work (Table 6), although fluorine is present in the Bongo granite samples (Table 4S). Lithologic and drilling data were not available for this study, however the weathering profiles of geological environments similar to the study area consist of highly weathered material rich in clay or silt close to the surface, with an increase in sand and a decrease in clay with depth until the fresh granitic rock is reached (Martin, 2006). The weathered layer in the region can be as thick as 100 m, but is generally no > 30 m, with the vast majority of wells in the region installed within the overburden (Apambire et al., 1997). Martin (2006) documented that the median borehole depth in the region was 37 m for 32 well logs, with the majority of drilled boreholes installed through the weathered zone and a few meters into fresh rock. Only 3 of the 32 boreholes were categorized as tapping the fractured rock, while the others tapped the regolith aquifer. Groundwater recharge from precipitation was not estimated for this study, but Martin and van de Giesen (2005) estimated approximately 4 cm of recharge for 90 cm rainfall – about 4.4% – for areas in northern Ghana and Burkina Faso with weathered rock (sources: Diluca and Müller, 1985, Dieng et al., 1991 and references therein; Milville, 1991). Martin (2006) observed that higher water levels in wells tend to be in the higher elevation granitic areas, which may be due to increased recharge rates coupled with decreased horizontal conductivity. Domenico and Schwartz (1998) similarly noted that high elevation areas are generally considered recharge zones where vertical flow dominates. In the current study, the highest elevation area of Done (Fig. 3) at approximately 250–260 m likely has the most pronounced vertical flow and greatest precipitation recharge, with the surrounding communities of Tendongo, Nayire, and Abungo (~ 245 m elevation) also receiving precipitation recharge. Several open wells throughout the study area had minimal seasonal fluctuation, indicating horizontal flow, while others fluctuated dramatically – up to seven meters, indicating seasonal vertical flow (Fig. 4). Because lithologic data were not obtained for any part of the study area, the location of clay layers was not identified. However, parts of Koom, Abasikoma, and Awale have areas with clayey soil that becomes ponded during the rainy season. Clay layers, which are usually found in low lying areas such as Awale and Abasikoma, restrict vertical flow (MacFarlane, 1992) and may also create discontinuous, shallow perched aquifers with water levels not representative of the water table (Martin, 2006). Even without lithologic data, the low elevation of these two communities – in particular Awale – combined with the hydraulic gradient and their proximity to an ephemeral stream surrounding Namoo to the north and east suggest that groundwater flow is primarily horizontal toward the stream discharge zone. The high fluoride groundwater is within or close to the Bongo granite with a decrease in groundwater fluoride at increased distance from the Bongo granite. The lowest groundwater fluoride concentrations are in the communities of Abasikoma and Awale, which is not surprising due to their distance of 1000 m or more along the flowpath from Bongo granite. One anomaly in the distribution of fluoride occurs in the community of Nayire where both the lowest (0.6 mg L? 1) and the highest (4.3 mg L? 1) average borehole groundwater fluoride concentrations in the study area are within 100 m of each other. In Table 2, they are sample numbers 1 and 15, and Table 3S samples 6N and 7N respectively. Borehole sample 1, 6N (0.6 mg F? L? 1) has lower pH and bicarbonate, and slightly higher conductivity than borehole sample 15, 7N (4.3 mg L? 1). Calcium and magnesium concentrations are similar in both wells; otherwise, the concentrations of other dissolved ions are higher in well 6N than well 7N (Table 3S). It is surprising to find a very low fluoride borehole so close to the Bongo granite. The low fluoride borehole may be relatively shallow (no drilling data are available) with elevated precipitation recharge – possibly due to elevated vertical flow caused in part by a large and deeply rooted tree adjacent to the borehole – as indicated by the low pH and bicarbonate, combined with surface contamination such as manure (causing elevated nitrate, chloride, sodium, potassium). Another difference between the two boreholes is that the high fluoride borehole was apparently drilled through a thick layer of rock – presumably fluoride-containing Bongo granite. There are no water level measurements for the low fluoride borehole, but the water level of the high fluoride Nayire borehole is quite low relative to other boreholes (Table 1) and the nearby open well (Fig. 4), indicating downward vertical flow. There does not appear to be a statistically significant correlation between major-ion water chemistry and fluoride concentrations, with two exceptions stated in Section 3.2.3 (Table 5). There is a direct correlation between magnesium and fluoride in the shallow open wells, and an inverse correlation between sodium and fluoride in the boreholes (Table 5). This is unexpected as increases in dissolved sodium and corresponding decreases in calcium and magnesium are generally associated with an increase in fluoride, due to surface exchanges between sodium and calcium or magnesium (Bond, 1946, Foster, 1950, Boyle, 1992). The direct correlation between fluoride and magnesium may be due to the dissolution of fluorine within biotite and amphibole since both minerals are present on Bongo granite and contain magnesium (Table 6), and also have been linked to elevated fluoride concentrations in groundwater. Results from Chae et al. (2006) indicate that biotite in granite is linked to elevated fluoride concentrations in groundwater; and Kanisiwa (1979) identified both biotite and amphibole in granite as high in fluorine. An even stronger direct correlation exists between fluoride and fluorite in both the boreholes and open wells (Table 5), which suggests that the major contributor to fluoride in groundwater is fluorite. The inverse relationship between sodium and fluoride is not clear, however, and the source of sodium may either be surface input or mineralogical. The direct correlation between nitrate and chloride in boreholes (Table 5) is likely due to the abundant agricultural activity and animal waste as fertilizer (Appelo and Postma, 2005). In four wells (two open and two boreholes) the nitrate concentrations are above the recommended limit for preventing methemoglobinemia or blue baby syndrome (Tables 2S, 3S) (WHO, 2011). It is interesting that no correlation between these two ions exists in the open wells. However, the boreholes with the most elevated nitrate and chloride are in the recharge area with notable vertical flow, while most of the open wells are in areas where horizontal flow tends to dominate and where shallow clay layers are more likely; and if open wells are to a depth below the clay layer, then groundwater contamination from nearby surface sources is less likely. Direct correlations between bicarbonate and calcium, and bicarbonate and magnesium (Table 5) are consistent with the results presented in the Piper diagram (Fig. 7) which indicates that most groundwater in the study area is classified as Ca-Mg-HCO3 water (60–80% Ca-Mg). Just three samples are under 50% Ca-Mg – one was collected from an open well in Awale (very high potassium and conductivity, Table 2S, sample 15Aw) and two from open wells in Akaamo (one with elevated conductivity and sodium, Table 2S, 27Ak). The two samples with very high potassium or sodium are considered outliers, possibly contaminated and or stagnant, and not representative of groundwater chemistry. Fig. 7. (a) Piper diagram of the distribution of major ions in water samples collected from open wells and boreholes. The four communities, Done-Abungo, in the left column of the legend are within or close to Bongo granite and at higher elevation. The four communities in the right column are getting farther from Bongo granite (except part of Koom) and are at lower elevation/down gradient from main recharge area. (b) Map of study area with location of communities, wells and fluoride concentrations, and general direction of groundwater flow. The Piper diagram results from Apambire et al. (1997) differed from this work in that they found groundwater samples collected in locations near Bongo granite spread between Ca-Mg-HCO3 and Ca-Na-HCO3 groundwater, with most in the latter category. Similar to the results from Apambire et al. 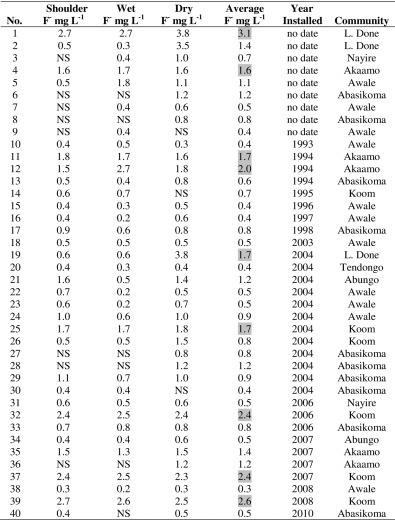 (1997), however, is the absence of high Na-HCO3 groundwater in Namoo, even though Bongo granite is ~ 50% albite ((NaAlSi3O8(s)) Table 6). Na-HCO3 dominated groundwater often contributes to high fluoride groundwater due to a decrease in dissolved calcium as it exchanges with sodium which then allows more fluorite to dissolve (Chae et al., 2007) – a process that is not occurring here. The stiff diagrams in Fig. 8 present the average major ion concentrations for open wells (OW) and boreholes (BH) in each of the eight communities. The anions are dominated by bicarbonate (Fig. 7, Fig. 8); and the cations are more widely and evenly distributed, with calcium dominating slightly in most cases (Fig. 8). The most notable exception is groundwater in the Akaamo open wells (very high sodium open well considered an outlier). Fig. 8 indicates that the shallow open wells (OW) and deeper boreholes (BH) in Koom have similar average water chemistry, and near-by Awale has similar groundwater chemistry to Koom (Awale has OWs only and lower fluoride). In Abasikoma the average groundwater chemistry in the shallow (OW) and deeper (BH) wells is similar, with slightly higher bicarbonate than in Awale and Koom groundwater, which are located just to the east and south (Fig. 3). In Done, where the groundwater level is highest, the shallow and deep well water chemistries are clustered close together in the Piper diagram (Fig. 7) and the average water chemistries presented in the stiff diagrams in Fig. 8 are similar as well. Only Nayire boreholes and Abungo open wells have unusually low dissolved ion concentrations as presented in Fig. 8, which indicates less evolved groundwater. Fig. 8. (a) Map of study area with location of communities and corresponding stiff diagrams for boreholes (except Awale which has no boreholes), well locations and fluoride concentrations, and general direction of groundwater flow. 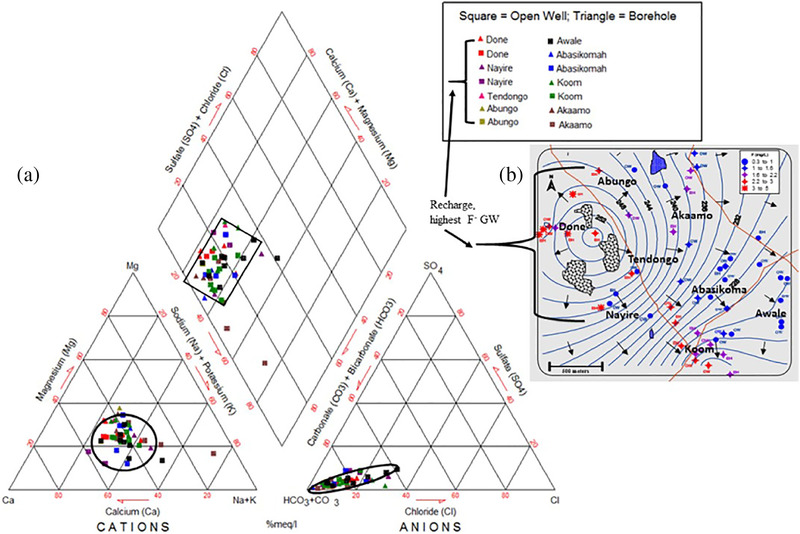 (b) Stiff diagrams of average major ion concentrations for boreholes (BH) and open wells (OW). Awale has no BHs, and Tendongo has one OW but with incomplete water chemistry data so it was omitted. Done, Tendongo, and Nayire are within Bongo granite. Parts of Abungo and Koom are close as well. Akaamo, Abasikoma, Awale, and the eastern part of Koom are the farthest from Bongo granite, and at lower elevation (down gradient). The overall pattern presented in Fig. 8 is that the communities with highest groundwater fluoride, which are in the recharge zone, have lower average dissolved ions and lower bicarbonate. These would be Done, Nayire, Tendongo, and Abungo, which are also within or close to the Bongo granite. The lower dissolved ion concentrations are likely due to precipitation recharge, where the other more distant communities are moving closer to discharge zones, which results in groundwater with higher ionic concentrations and bicarbonate due to continued evolution of groundwater chemistry along the flowpath (Domenico and Schwartz, 1998). Feldspar and quartz dissolution strongly influence groundwater chemistry in Namoo, with minor contributions from calcite, biotite, fluorite, and amphibole – especially in the recharge areas. Most groundwater in Namoo has moderate to elevated bicarbonate (Fig. 8), which is consistent with data presented in Apambire et al. (1997). PHREEQC (Parkhurst and Appelo, 1999) was used to determine the saturation indices of fluorite and other major minerals using the average major ion data from the boreholes and open wells in Table 4. Using the PHREEQC database the results show that, under these conditions, when fluoride concentrations alone are increased, groundwater reaches saturation with respect to fluorite at fluoride concentrations above 4.7 mg L? 1 for boreholes and above 4.6 mg L? 1 for open wells. These fluoride concentrations are very close to the maximum fluoride concentrations found in the study area, which likely explains why the highest fluoride concentrations in the area are 4.6 mg L? 1, both for this study and Apambire et al. (1997). Such conditions likely prevent further dissolution of fluorite – the primary source of groundwater fluoride – due to its saturation. In addition to running PHREEQC to determine the saturation indices of major minerals using the average water chemistry values for open wells and boreholes, the water chemistry data from each well (Tables 2S, 3S) were also used as input values to determine the saturation indices of major minerals from each water sample. 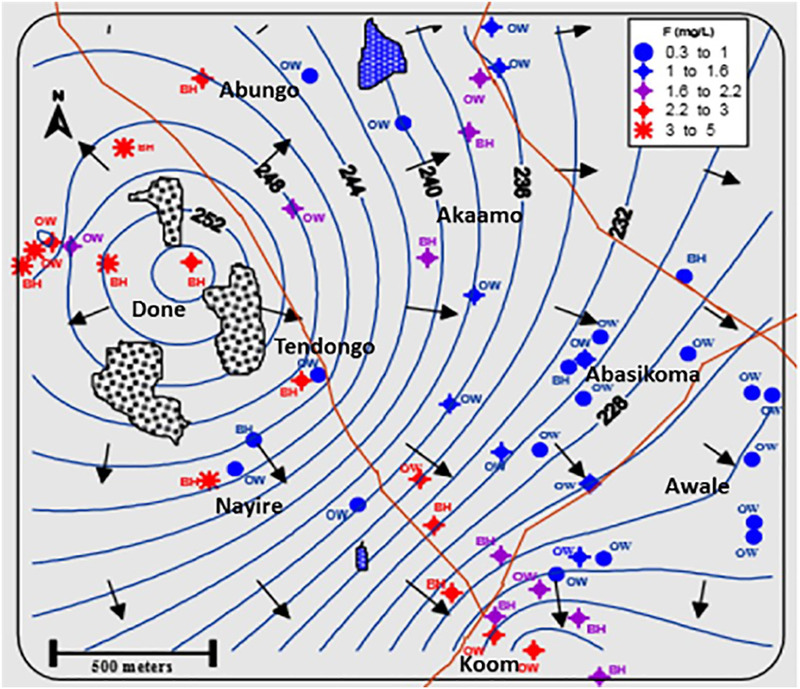 Calcite (CaCO3(s)) and dolomite (CaMg(CO3)2(s)) were occasionally saturated or super-saturated, in particular for open wells, including most of the open wells in Akaamo and Abasikoma, and one in Awale, due to higher bicarbonate concentrations. 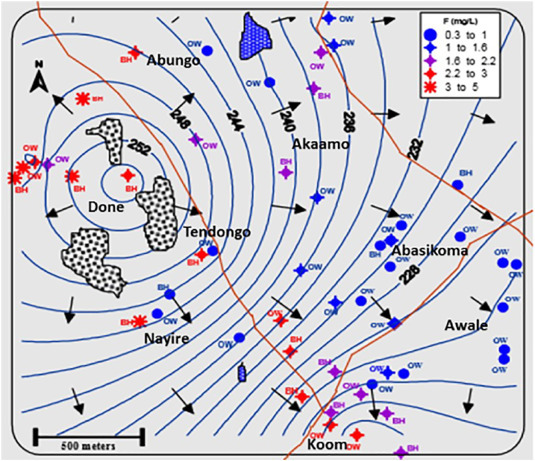 Overall, calcite and dolomite tended to be under-saturated in the recharge areas in and near Bongo granite, and saturated or close to saturation at a distance from the recharge zone. Unlike the major minerals described above, fluorite (CaF2(s)) was closest to saturation at the highest groundwater fluoride concentrations (~? 0.2) located in the recharge zone, and was well below saturation at lower groundwater fluoride concentrations farther from the Bongo granite. This pattern indicates that fluoride concentrations are not decreasing as a result of fluorite precipitation. There is also not likely to be fluoride adsorption onto clay at the depth of the boreholes, as the rock material is only moderately weathered and clay is absent (Hazell et al., 1992). However at depths closer to the shallowest open wells where clay may be present, fluoride adsorption is possible. Kaolinite (Al2Si2O5(OH)4(s)), for example, though not a strong sorbent for fluoride at the pH of most groundwater can remove small quantities of fluoride from solution via adsorption (Coetzee et al., 2003). At the depth of boreholes, the decrease in fluoride concentrations with distance from Bongo granite is likely driven by the physical processes of longitudinal and transverse dispersion rather than chemical reactions, as groundwater travels radially away from the source of fluoride (Bongo granite) and into the surrounding areas. The simple three-dimensional solute transport models of groundwater fluoride distribution presented in Fig. 5 simulate homogeneous steady state conditions and exclude chemical reactions. Even though true aquifer conditions are certainly more complex than assumed here, the modeled results compare fairly well with the observed distribution of fluoride in Namoo (Fig. 3). The model results estimate that fluoride concentrations drop from 3.2 to the WHO (2011) recommended limit of 1.5 mg L? 1 approximately 400–500 m from the source, with the decrease in fluoride concentrations a result of dispersion. The modeled distribution of groundwater fluoride is similar to fluoride concentrations occurring in the field. Observed variations in the distribution of groundwater fluoride may be due to field conditions that are certainly more heterogeneous than established in this model, and also the transition from fluorine-containing granite to that which lacks or has minimal concentrations of fluorine may not be an abrupt shift. The study area of Namoo in the Bongo District of the Upper East Region of Ghana relies almost entirely on groundwater for household use. In an effort to improve access to water, 12 boreholes have been drilled and installed with hand-pumps between 2005 and 2013, and 23 hand-dug open wells have been installed between 2003 and 2010. Five of the newer open wells and 10 of the newer boreholes have groundwater fluoride concentrations above the WHO (2011) recommended limit of 1.5 mg L? 1. Four boreholes (all installed after 2005) have average fluoride concentrations of 3.4–4.3 mg L? 1. In addition, four of the newly drilled boreholes remained closed due to high fluoride concentrations (averaging 2.7–4.3 mg F? L? 1), but community members had the hand-pumps installed, thus making them useable. Consuming such high concentrations of fluoride puts users at risk of severe dental fluorosis as well as skeletal fluorosis, which is even more serious (WHO (World Health Organization), 1984, WHO (World Health Organization), 2011). Therefore, either treated water or other sources of low fluoride water are needed in these communities, and in other similar areas in the region. Low-cost and low technology water treatment, and small-scale rainwater catchment systems are being considered. Another option that should be considered is to locate areas with low groundwater fluoride and high enough yield to allow for collection and transport to high fluoride communities. In Namoo these areas are located approximately 500–1000 m from the Bongo granite outcrops. The upfront costs of such an approach are high, but the long-term access to a reliable water source also increases substantially. If installed properly, the day-to-day maintenance should be low for years to come, unlike water treatment systems which require continual maintenance. However, as with all proposed solutions for improving access to high quality drinking water in economically poor communities, the question of who will cover the cost is always present and is rarely resolved. Government subsidized projects would be optimal at least to get them established, but to date this does not appear to be an option. This research was generously supported by the University of Nevada, Reno, the Desert Research Institute, a U.S. Environmental Protection Agency Science to Achieve Results Graduate Research Fellowship (FP9 17230), and a Sigma Delta Epsilon-Graduate Women in Science Nell Mondy Fellowship. We thank the Bongo District Assembly for its support, Philomina and Tony Atanga for assisting with the field work, as well as the community of Namoo for its support. We also thank Dr. Braimah Apambire for his earlier fluoride research in the region and suggestions for this study.